I recently upgraded Jenkins (https://jenkins.io) to the 2.0 version and had to setup all the jobs again. It is quite a manual process and I wonder if this can be automated in some way. There exists a Gradle plugin (a plugin to use in a Gradle build script) to automate setting up a Jenkins server, see https://github.com/ghale/gradle-jenkins-plugin/wiki. This solution automates the one-time process of setting up jobs. I find this approach interesting, although a bit too much at this point. In the Jenkins 2.0 version, I noticed Multibranch Pipeline jobs – these jobs get most of their configuration from a script that you put in the source repository. This is a great solution, since you can version the configuration and don’t have the manually enter at the Jenkins user interface. Another great feature is that a multibranch pipeline scans your Git repository for branches and builds all of those branches automatically. The way you configure a Multibranch Pipeline is by configuring the repository and how the build is triggered. The easiest way is to trigger periodically. 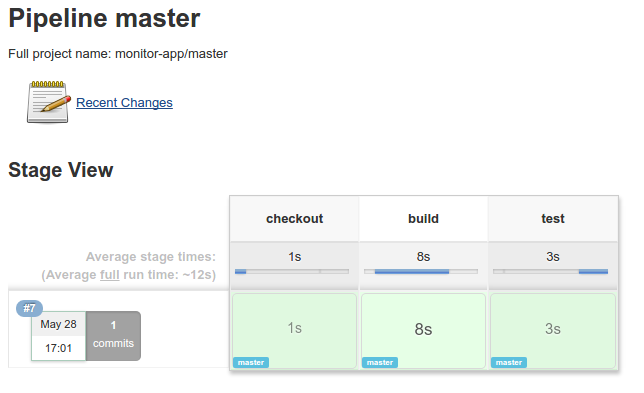 That is all the configuration that you enter on the Jenkins user interface. After this configuration, Jenkins will look at all your branches in the repository and look for a file in the root with the name “Jenkinsfile”. This file should contain a Groovy script that performs the build. This script will checkout the branch from the repository and execute “./gradlew clean build”. After you added this file to your repository, you can manually trigger Jenkins with Build Indexing/Run Now. You will will see a list with all the branches that have a Jenkinsfile. This is great if you want to make sure that the code that is committed the repository actually compiles. This will produce a nice report of all the stages. Now you can quickly see how long each stage took and if it is successful. It would also be nice to show the results of the tests, and I will explore that in another post.